Ramble about 40 miles west of the university town of Madison, Wisconsin, and you’ll happen upon a 300-acre conservancy where rugged terrain, heavily wooded hillsides and towering rock cliffs dominate the landscape. And somewhere in the middle of that beautiful, untamed area sits a timber home that’s been two decades in the making … And it shows. With the plot poised and ready for its dream home, the Van Sicklen’s considered their options. 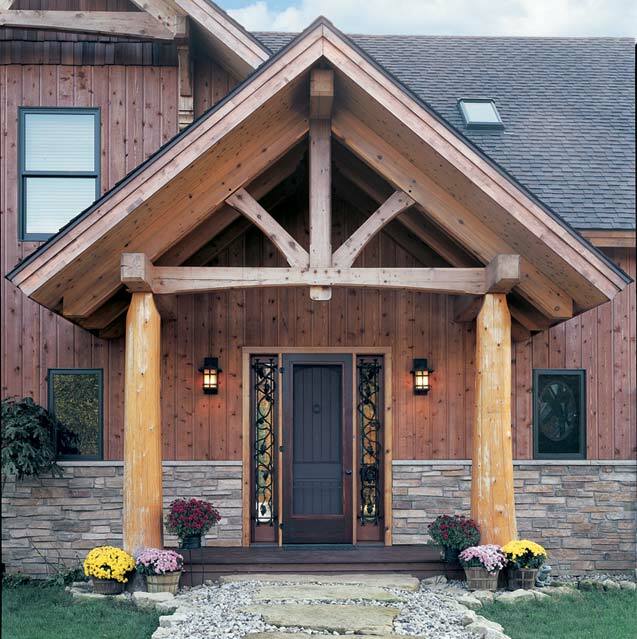 The duo looked into log homes, earth homes and traditional construction before deciding on a timber home that would “match really well with the surrounding forest,” says Susan. After traveling to Canada to meet with two different timber home manufacturers, the Van Sicklens began working with Ontario-based PineRidge Timberframe and architectural firm Bauhaus Designs out of British Columbia to design their home. In order to take advantage of the stunning vistas, the home features a three-story, curved turret and a second-story sleeping porch. The great room was designed with 30-foot-high ceilings and a southern-exposure window wall, which transmits the most amount of solar heat during those frigid Northern winters. In March 2005, PineRidge delivered the custom timber home package to the site. The four-bedroom, 3 1/2-bath home is made primarily of white pine, with Douglas fir for heavy load points and decorative cedar roof features. Post-and-beam framing with mortise-and-tenon joinery was used throughout the home, along with chamfered edges and radius braces to add visual pizzazz. Traditional Carpentry Inc., a local company, handled the interior finishing, including some personalized decorative elements like the large, oval stained-glass window in the master bathroom. Coyotes and owls provide a natural soundtrack that helps the pair quickly forget the hubbub and stresses of the preceding day. A white pine tree harvested from the surrounding land extends from floor to ceiling in the room and reminds the couple of just how special their timber home is. For not only is the home situated on land Mike’s family has owned for three generations, it’s also situated in the Wisconsin’s Driftless area—a small corner of the state that was missed by the glaciers that flattened much of the Midwest. Located high on a hill overlooking two picturesque valleys—with no other structures or fields within site—the three-story abode serves as the perfect backdrop for entertaining, outdoor activities and relaxing.